WASHINGTON, DC, May 6, 2004 – General Atomics Aeronautical Systems, Inc. (GA-ASI) and Lockheed Martin [NYSE: LMT] successfully demonstrated their low-cost, low-risk, highly capable solution for the U.S. Navy’s Broad Area Maritime Surveillance (BAMS) unmanned aerial vehicle (UAV) program at a recent flight exercise in San Diego. U.S. Navy, Coast Guard and Homeland Security officials observed the operation firsthand at Lockheed Martin’s Global Vision Center (GVC) in San Diego or through a real-time secure webcast. The team’s solution – built around a proven, low-cost air vehicle system, established sensors and network communications capabilities – is designed to expand the Navy’s ability to conduct broad area maritime surveillance and provide persistent Intelligence, Surveillance and Reconnaissance (ISR). This flight was the first time that a 360-degree maritime surface search radar was demonstrated on a U.S. remotely piloted aircraft. The system is configured for an operator to direct the aircraft operating in an autonomous mode by point-and-click commands while simultaneously controlling the radar and day/night electro-optic video cameras. The Mariner demonstrator aircraft took off from GA-ASI’s Flight Operations Facility in El Mirage, CA. Transiting via an IFR (instrument flight rules) flight plan in national air space, Mariner flew through the Los Angeles vicinity to the operating area off the coast of San Diego. Operator control was passed to the ground control station located at the GVC, where the Lockheed Martin and GA-ASI mission control system took over both the aircraft and its sensors, establishing Level 4 control. Level 4 control was demonstrated at the GVC and on the webcast using a Lockheed Martin Valiant™ display workstation, a next-generation variant of the AN/UYQ-70 (Q-70) program. Lockheed Martin Q-70 displays, controls and operating systems are widely used in U.S. Navy applications on sea, land, and airborne military platforms. The San Diego GVC is one node in a nationwide network developed by Lockheed Martin to demonstrate net-centric capabilities and interoperability with remote platforms, such as BAMS. All radar and video intelligence products were downlinked from the Mariner to the GVC while concurrently being simulcast on an encrypted Web site for worldwide observation. 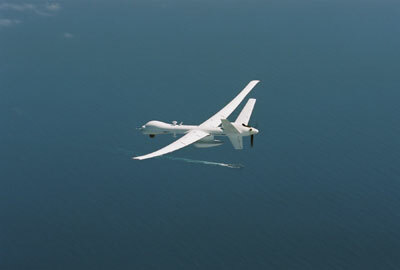 Prime contractor Lockheed Martin and GA-ASI teamed in August 2003 to pursue the U.S. Navy BAMS UAV program. Headquartered in Bethesda, MD, Lockheed Martin employs about 130,000 people worldwide and is principally engaged in the research, design, development, manufacture and integration of advanced technology systems, products and services. Headquartered in San Diego, CA, General Atomics Aeronautical Systems, Inc. employs over 1,000 people at more than six locations. The company is completely focused on the design, development and employment of proven unmanned aircraft systems for customers throughout the world. For additional information, visit www.lockheedmartin.com; www.uav.com. Photos of the aircraft, sensor information, live briefing can be requested through contacts listed below.